Iran, hemmed in by the economic sanctions, is an economy of almost 80 million people. The streets of Tehran show a different side to Iran than the news. Schoolgirls punch in the pin code on their mobiles to check what’s new on Instagram. It’s a normal Monday in Tehran, the capital of Iran. Their screens show a flow of images from around here: a young man skating, a mat seller, and a group selfie of dark-featured girls – just like these students, sitting in a café with sneakers on their feet and scarves covering their heads. ”Using social media is not allowed in Iran, but everybody is doing it”, says an Iranian man sitting next to me. There are 15 million people residing in the greater Tehran area. The traffic is as you would expect: busy and highly polluted. However, this coffee shop, located in the charming park that surrounds the cinema museum, is a haven of tranquility. Here you can buy fresh pomegranate juice, grilled sandwiches, and salads. The wi-fi works like a dream. On the table is a copy of Tehran Times, the English daily. It features an article from The Wall Street Journal, its headline jumping up from the page: Iran tries to open up for business. That is the very topic on many lips here: is Iran opening up? Most of the store signs in the malls are in Farsi, but there are also many familiar brands: Zara, H&M, Calvin Klein, Seiko, Abercrombie & Fitch, Nike, Lego. Could this fascinating, yet unpredictable country really open up to the West – or could the West move closer to Iran? One thing is clear: Iran has plenty of business potential. There are many obstacles on the path to openness, the most obvious of which are the economic sanctions imposed on the country by the West. The mood in the café is quite continental: cappuccinos and faintly playing music; chairs and tables built from construction pallets in the spirit of trendy interior magazines, a group of German tourists. Prices, too, are reminiscent of Starbucks. In the nearby bazaar, vendors weigh saffron, nuts, dried fruit, and chopped herbs on a scale for their customers. Fall is well underway but it’s still warm, over 25 degrees centigrade. However, the reality confronting us in the newspaper is chilly. Relations between Iran and the international community are strained by an ongoing conflict over Iran’s nuclear program. The West suspects Iran is aiming to develop nuclear weapons. Iran, meanwhile, claims the nuclear program is only intended for energy production and civilian purposes. Some progress has been made during the reign of Iran’s current president Hassan Rohani, but here in Tehran it is easy to see the impact of the sanctions. There are no ATMs, and Western credit cards are not accepted anywhere. Only cash, in other words the Iranian Rial, is used. The economy is halting also within the country: inflation is rife and unemployment high, especially among the highly educated. Walking around in Tehran you might come across a street corner where loud bargaining over dollars is taking place. The men shout their offers for wads of dollars while counting the bills in their hands - almost like a live version of the stock exchange. The latest talks on Iran’s nuclear program ended in November, once again without results. However, the US, Russia, Germany, China, France, and Great Britain all reported their willingness to continue negotiations. The new deadline is set for June 2015. Sanctions have been loosened while negotiations are ongoing, but oil exports as well as the fields of banking and finance are still regulated strictly. Clothes, food, medicine, health products, and educational exports, on the other hand, are not affected by the sanctions. The taxis outside Tehran’s business hotels are filling up mostly with Chinese, Korean and Russian visitors. Western businessmen are a rare sight. Asia has filled the gap left by Western countries leaving Iran due to the economic sanctions. Tehranis laugh that French automobile dealers walk around with the list of sanctions, trying to figure out which car parts are affected and which are not. A lot of Peugeots, for instance, are made in Iran. The value of Finland’s export to Iran has dropped by approximately 75 per cent compared to what it was in 2006. In 2012, exports totaled EUR 50 million. The same decrease has been seen in other EU countries. But statistics don’t tell the whole truth, since the majority of Western products in Iran arrive through third-party countries. Western companies usually circulate the cash flow via Turkey or the United Arab Emirates. Transferring funds from Iran to Europe is complicated: direct transfers cannot be made to banks operating in the West due to the threat of sanctions by the Federal Reserve of the US. However, it is fairly common know- ledge that some southern European states and American companies openly deal with Iran. But is the situation becoming normalized? Many hope so, at least. Iran has nothing but potential: close to 80 million educated inhabitants, oil money, and a trading culture on the mythical Silk Road stretching back thousands of years. Iranians have purchasing power and are familiar with Western consumerism. Iran is the fourth largest producer of petroleum in the world, and the known oil reserves are the third largest after Saudi Arabia and Venezuela. The country is also one of the founding members of OPEC and holds the world’s second largest reserve of natural gas after Russia. Many Western companies are anxiously awaiting the end, or at least the easing of, sanctions against Iran. The Wall Street Journal recently quoted sources reporting that senior executives from Apple had met up with potential Iranian resellers in London. According to the news, Apple is considering to embark on the same path as many other Western companies: entering the Iranian market, should the sanctions permit. The iPhone is already a common sight on Iranian subways and buses. Shop windows display a row of the latest iPhone 6. According to the seller, they cost approximately a thousand dollars, and demand is high. You can sometimes spot Western products in Tehran that will leave you scratching your head as to how they got there. The black market is thriving, but so is the sale of legally imported products that are not affected by the sanctions. A number of companies dealing with Iran are reluctant to talk about business in public, as the country is a risk investment, and regulations and related interpretations applying to monetary transactions change all the time. One also gets the feeling that the unwillingness to shed light on Iranian connections is down to the country’s bad reputation. The companies share an interest in the business potential offered by the country, while also recognizing that with rules and regulations prone to change at the drop of a hat, there are also risks involved. Some have managed to find an importer in Iran willing to carry some of the business risk. Mining technology company Outotec has been doing business with Iran since the 1970s. In the summer of 2012, a deal was clinched that meant Outotec would deliver 265 million euros worth of technology solutions and services to a state-owned mining company in Iran. Outotec manages its Iranian operations from its Middle East Market Area Unit in Dubai. According to the export director of a Nordic company taking consumer products to Iran, experiences in dealing with Iran have been positive, although there is a lot of red tape to get through. Previously, export permits for products had to be renewed annually through three different government ministries. Now the permits are issued for four years at a time, but new rules have been added: the products must include labeling in Farsi. Also product deliveries have slowed down by long distances and customs procedures, and products must be equipped with a hologram sticker that indicates the ministry’s import permission is in order. And that’s not all: Western production facilities have to be inspected by international auditors approved by the Iranian Ministry of Commerce. At home, the company needs to stay in contact with the Ministry for Foreign Affairs e.g. to report that business partners are not blacklisted due to EU sanctions. The permit procedure does have some positive aspects: large Iranian chain stores can only sell officially imported products, which helps those willing to deal with bureaucracy by the book. Companies exporting Western products into the country state that Iranians appreciate high-quality products. There is also a certain sense of luxury attached to Western products, which are fairly expensive compared to e.g. the Turkish, Chinese, or local varieties. Compared to China, Russia, and Arab countries, there is a closer affinity with Iranian business culture, which is marked by a Western feel. People are highly educated and promises are kept. Martin Talvari, Chief Strategy Officer for startup event Slush, has just woken up. It’s five in the afternoon and we are sitting in a café on Aleksanterinkatu in Helsinki. Talvari has just returned from a world tour with Slush, hence his severe jet lag. Slush is an event promoting entrepreneurial growth that brought together thousands of entrepreneurs and investors in Helsinki in November. In addition to Finland, Slush has visited 80 different countries in the course of a year. ”Iran was one of the most interesting countries we visited. Perhaps even THE most interesting”, says Talvari. How did a startup event like Slush end up going to Iran? Talvari, too, approaches Iran from the perspective of potential. He points out that the population is large, and a majority can afford – and want to – use technology as well as digital products and services. It also helps that Iranians are highly educated, especially in the fields of technology and science. Iran boasts many engineers, a large number of whom are women. In the autumn of 2014, Iranian Maryam Mirzakhani became the first woman to receive the prize some call ’the Nobel of mathematics. ”Their mind is all about business”, says Talvari, who is himself Estonian. Would he consider doing business in Iran? Talvari’s arguments are shared by others eyeing the country. The startup world is also enticed by the fact that Iran is a young nation demographically: 64 per cent of Iranians are under 35 years of age. The Slush event in Tehran attracted a crowd of 250. A pitching competition was held in the country backed up by the Iranian network of Aalto EE, and an Iranian delegation also took part at Slush in Helsinki. Iranian startups and the technology scene are now developing at full speed in the hands of the locals. There is hardly any international competition, and local versions of global brands are being established as we speak. Iran’s eBay is called eSam, Amazon has inspired Digikala, Iran’s Rovio is called Lady Birds, Iran’s Blogger is Persan Blog. Café Bazaar is the name of Android’s application store selling 10,000 local apps. According to the World Startup Report, the value of Café Bazaar is approaching 20 million dollars. Digikala is estimated to be worth 150 million dollars. The startup ecosystem has emerged in Iran over the last two years. Venture capital funding and accelerators are on the rise. Still, launching a startup in a closed economy that operates by its own rules is never easy. “It’s definitely more difficult than in any other country,” says Eyad Alkassar in an article by The Washington Post that described the startup scene in Iran. Alkassar manages the Middle East investments for Rocket Internet, a German company that replicates successful businesses in the developing world. In order to do business in Iran, you need a local partner who can help you navigate the bureaucracy and cultural issues as well as make the necessary contacts. Talvari from Slush says that just like Western companies are hankering to go to Iran, Iranians taking part in Slush were keen to join an international business. If the country does open up, many in business will be helped by the fact that migrant Iranians are now spread out all over the world. The network already exists. The subway takes me to the center of Tehran city, the station of Haft-e-tir. Obama looks down from the facade of a building by a busy square. The drawing is not flattering. ”Ridiculous”, scoffs a Tehrani man. He thinks the relationship between Iran and the US is marked by hypocrisy. Iranians flock to the West to work, live, and study. Rather than hate the Americans, Iranians envy them. Countless Iranians hold green cards. This man is yet another Iranian who is eager to show his city to foreigners. I choose not to name everyone who appears in this article, since many are cautious when it comes to talking about politics or religion. We walk along Valiasr Street, and talk about the Iranian diaspora. Many Iranians choose to move abroad and the brain drain greatly dismays everyone, although this is a country people have often found reason to leave: whether fleeing, going to war, or simply searching for better luck and greater freedom elsewhere. The most recent wave of emigration started before the Islamic revolution. The Migration Policy Institute has collected detailed figures, especially on the movements of Iranian students. In the academic year 1977–1978, approximately 100,000 Iranians studied abroad; over a third of them in the United States. At the time of the revolution in 1979–1980, Iranians studying in the US already numbered over 50,000. At this time, there were more Iranian students in the US than from any other country in the world. The flow increased when the students never returned, on account of the revolution. Instead, their relatives followed them in moving west. However, not everyone left Iran voluntarily. Many non-Muslims were forced to leave. Iran has continued to bleed money and talent also after the revolution: virtually every Western country is home to a community of Iranian expats. In the early 1980s, with Iranian society still in chaos following the revolution, came the war between Iran and Iraq. That, too, gave rise to a wave of emigrants as many fled the war and the draft. It is estimated that e.g. every third physicist and dentist left the country in the early 1980s. The other category is represented by the relative of the hotel reception clerk: barbers, cooks, workers, assistant nurses. So why is Iran leaking money and competence into the rest of the world? But not everyone stays away. The dismal financial situation in the West makes many view their country with new eyes. Experiences of xenophobia also affect people’s desire to move back home. Everyone here is familiar with the riots in Swedish suburbs and the anti-immigration political movements and parties of Central Europe, both from the news and the stories of their relatives. Iran is used to being at the heart of global trade, placed as it is between east and west. Many products that we consider Western, such as spaghetti and macaroni, have come to us from the East via Iran. Most of the time, however, the filter through which we view Iran is that of its conservative religious leadership. Sanctions aside, this is Iran’s other big problem: its appallingly bad reputation abroad. Iran is remembered for the Islamic revolution of 1979, the lengthy war with Iraq as well as the infamous list drawn up by George W. Bush, naming Iran as part of the ”axis of evil”. The news from Iran are grim indeed: A human rights activist was arrested, a woman condemned for murder was executed, and a group of Iranian youths dancing to Pharrel Williams’ ”Happy” were given suspended sentences and whipped. Iran is governed by a conservative parliament that is currently striving to e.g. diminish women’s access to birth control and abortion, which is illegal in most cases anyway. In a speech he gave in August, President Rohani described the situation by saying that Iran desires closer relations with the outside world but has to conquer three fears when it gets there: the fear of Iran, the fear of Islam, and that of its Shi’ite branch. A majority of Iranians are Shi’ite Muslims. Iraq, too, has a Shia majority, whereas headline-dominating ISIS is a Sunni extremist movement now sowing destruction in Iraq and Syria. The Syrian majority is Sunni. It will take more than the words or wishes of the President to accomplish change. He is considered a moderate reformer, but at the end of the day, Iranian policy is determined by the hardline religious leadership. The ’Supreme Leader’ of Iran is the gray-bearded Ali Khamenei. The President is hoping to draw nearer to the West. But how can that be harmonized with the conviction and leadership style of the religious authorities? Those who know Iran well are more prone to ask rather than answer: What kind of steps could Iran take? Has the country been left out in the cold, or chosen its own isolation? Could a country that won’t allow freedom even to its own citizens be modernized? Is the human rights situation getting better or worse? On the streets of Tehran at least one thing is certain: Iran looks like a fairly modern business partner. There’s a long line of shops full of cosmetics and hair extensions, over there trips to India and Paris are advertised, in that shop window stands a long line of Tunturi stationary bikes from Europe. Newspapers and social media are full of stories from the rich northern part of Tehran: stories of flowing drinks, miniskirts, expensive cars and watches, endless partying. Iran is roughly the size of Peru or Mongolia. It is home to more people than Spain and the Nordics together. A majority of Iranians are ethnic Persians. Approximately every tenth Iranian is Kurdish, and there are numerous other groups: Gilakis, Mazandaranis, Lurs, Balochis, Azeris, Turkmen… Arabs account for only one per cent, virtually the same as the Jewish population. On the streets of Tehran you will hear Farsi, Turkish, Kurdish, and Afghani Persian spoken. Lonely Planet is right in saying that the most important sight in Iran is the people. The atmosphere of the country is polite, warm and friendly. A foreigner is given no time to even start looking for the bus, the taxi, or the way to the hotel, before someone is offering to help and demands to make sure you get there okay. And no, they are not trying to sell you anything or impose on you in any way. Iranians are exceptionally polite. ”We have a saying in Iran that strangers are a gift from God and should be treated well”, explains a man who escorts me to the right bus stop, almost half an hour’s walk away. He thinks this helpfulness could also come from Iranians wanting to mend their poor reputation. This well-refined art of politeness should also be taken into account in any business dealings with Iranians. There is a culture of almost court-like sophistication here that doesn’t only apply to the upper classes, but permeates the whole of society. If you do not understand, for instance, the different facets of respecting your elders or guests, you are more than likely to commit a faux pas. Hardly any Westerner does business in Iran without the help of local consultants. They not only help you navigate the different limitations and rules, but also the tricky waters of Iranian etiquette. The first rule of operation in Iran is thus to find a reliable local partner who is familiar with the local enterprise culture and legislation. There is much more hierarchy here than in the West, and local help is therefore necessary – much like in, for instance, China. Finland’s Ambassador to Iran, Harri Kämäräinen, explains it as follows: Iran is an Islamic republic and that dictates the rules. However, he also points out that the country has a cultural legacy that is thousands of years old and many customs trace their history back to the pre-Islamic era. ”You have to respect the etiquette, but it is good to remember that it is not only connected to Islam”, says Kämäräinen, who has lived in Tehran for two years and is fluent in Farsi. The scarf. This scarf. In Iran every woman, including foreigners, must cover their head with a scarf and otherwise wear modest clothing. Arms and legs must not show, and tight clothing is forbidden. Iranian women usually dress one way at home and another in public. ”Look at those girls”, says a man sitting next to me in the coffee shop, nodding towards a group of school students. They are drinking fruit slush and laughing at something on the phone display. The waitress brings special coffees to the tables and takes orders. ”Officially, women shouldn’t even be allowed to work in cafés”, says my company. Many rules apply to women in particular. They are not allowed to smoke in public, they have their own section of the bus (in the back) and the subway. In addition to ”Women only” subway cars, there are cars where women may go only when accompanied by a man. Regardless of such constraints, many say the same as my companion: women are the hope of Iran. A majority of university graduates are women, and looking at the streets of the big cities, it is clear that the dress code is gradually being eased a little. Many women wear a lot of makeup and have eye-catching nails, and sometimes the scarf sits quite low on the head. An Iranian-American website for women called Payvand, established in California’s Silicon Valley, writes that university education is a way for Iranian women to leave home, postpone marriage, and thus achieve greater freedom and respect in society. Women are changing the Iranian labor market and family setup. They still account for only ten per cent of the workforce, but families are shrinking and women nowadays find work in engineering and business, not just as secretaries and nurses. This development is already worrying the religious conservatives. It has been suggested that a quota for women be introduced in the medical schools, where women students already outnumber the men. Samar and Friends’ showroom is located in northern Tehran, near the mountains towering over the city. CEO Samar Modonpour, 34, opens the door dressed in jeans. Samar and Friends sells scarves, shawls, and traditional manteau jackets to Iranian women. The clothes are made by four Iranian women who work from home. ”Naturally I want to employ Iranian women”, says Modonpour. All clothes are designed at Samar’s company, but the inspiration comes from abroad: Dolce & Gabbana and Versace are carefully monitored. The company then makes suitable Iranian versions of their designs. Modonpour grew up in the US and Canada, but returned six years ago. Her intention was just to visit, but to her own surprise she and her brother decided to stay in Tehran. Iran was enticing, mostly due to the business opportunities. Her brother established the Iranian version of eBay, called eSam, and is now working downstairs from Samar in an office housing around twenty employees. Both keep their businesses online. In Samar’s showroom there is a social media desk, where twin sisters sit posting new images to the picture streams of Samar and Friends. Samar’s Facebook page and Instagram account have 47,000 followers each. eSam, on the other hand, has introduced Iranians to Internet auctions. The online auction functions just like eBay, but Iranians are interested in selling slightly different ware than we are used to in the West. Popular items are old coins and sacred texts. Modonpour says that people in Iran need to learn a whole new culture of buying online. Outside the showroom of Samar and Friends lingers the fragrance of Tehran; its thin, dusty air. Tehran lies at an altitude of almost 1.5 kilometers, and the further north you travel in the city, the higher up in the brown mountains you go. 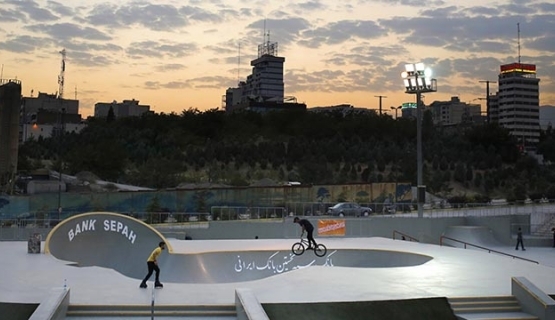 The southern end is poorer, and if you travel about an hour on the subway you might find yourself in the suburbs of western Tehran: grey high-rise buildings in the yards of which parkour, skating, and even graffiti is going on. Iran is a country with some of the world’s oldest cities and streets, the most splendid mosques, desert, seashore, mountains, and incredibly picturesque landscapes. There is even a ski resort near Tehran, where Finns came to build recreational timber villas in the 1970s. Could Iran become more familiar to the West? Who would be a good fit for an Iranian business partnership? International corporations for sure, but also small and medium-sized companies. Those who know Iran well say that demand is high for e.g. textile industry machines and devices, elevators and escalators, cleantech solutions, automation technology, wood products and forest industry products, as well as paper and paper industry products. Iran is also an important mining country. Iranians are also increasingly interested in design. The Italians, Danes, Germans, and French are already successfully exporting design products to Iran. Financially, Iran is in the same transitional phase as some developing economies, such as Venezuela, the Philippines, Kuwait, Libya, and Angola. If there is one thing that Westerners with experience of doing business in Iran agree on, it’s this: Iran has both potential and risks. The bureaucracy is difficult, but the people are by contrast exceptionally easy to deal with. Finland’s ambassador in Tehran, Harri Kämäräinen, expresses it well.